The second night of the weekend was less serious, somehow. A wedding to unite two lives was celebrated in a new, suburban church. Like most other weddings these days, the ceremony was perfunctory: something to be done, to be gotten through, so life could proceed, and the party could begin. It was a celebration, the people were earnest, but it lacked a seriousness that was electric the previous night. The first night was an attempt at translation. 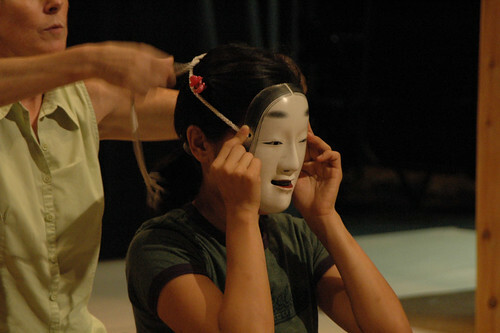 The Japanese Noh tradition: an actor had come to tell a story cast in ancient days in Japan, had come into modern America, into the modern Midwest. The Buddhistic sense that life is a cherished illusion, heavy, pregnant with some odd sense that life is us and within us, played upon a stage to be watched by passive lives who, while watching, live suspended in the sense of not-so-sure that we are here. Life, flowing like the Tai Chi we had been studying, never suspended, but like the rhythms of heart’s beating bump-bump, it told a story of a heroism that life forces against the death which is our destiny. Flowing, but with a care and expertise of every moment’s yearning, to play upon the eye’s viewing and body’s understanding. Two celebrations of life, two nights running, yet the second promised a futurity less filled with the love of life that life appreciates.